The Lilliput is the horizontal boilered version of the Jenny Wren. They are both similar size, in fact they share many of the same mechanical parts. The Lilliput boiler is somewhat larger, despite appearances. The length of the Lilliput boiler is equal to the height of the Jenny Wren boiler plus firebox. The engine unit is identical. 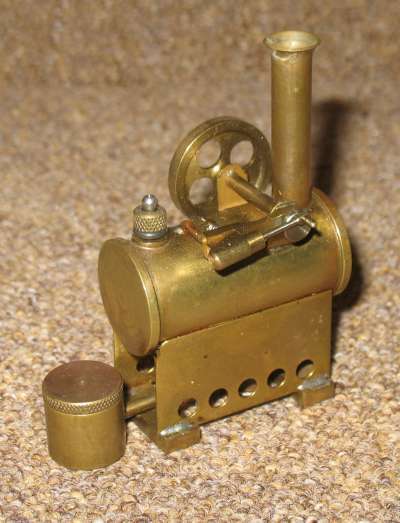 It was supplied as a kit of parts, all ready machined and easily assembled with a modicum of soldering skill and a set of small fingers being the only requirements. The overall height is 75mm. The horizontal boiler is 22mm diameter and 46mm long. It has a single flue tube, passing vertically through the horizontal boiler (unusually for a horizontal boiler), integral with the chimney. The 15mm dia. tank for the burner holds enough meths for about 5 - 10 minutes running. 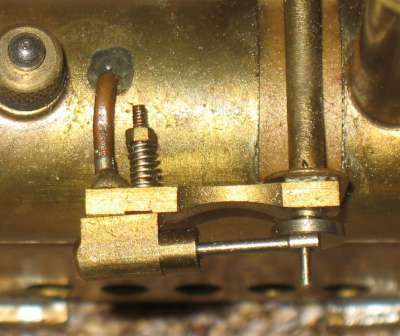 The meths is fed via a thin pipe to a small wick under the boiler. The minuscule cylinder is 3mm dia. with a stroke of about 5mm. This drives the 24mm dia. flywheel at one hell of a lick with no load! There is no obvious power take-off point provided but I'm sure the flywheel boss could be extended to provide a mounting for a pulley or gear wheel. There's not much torque but plenty of revs so, with suitable gearing, the power would not be insignificant. In order to give the engine a little more weight and stability, I have soldered two bars of brass onto the base. I've given the date of this engine as 2007. This was when I assembled the kit. 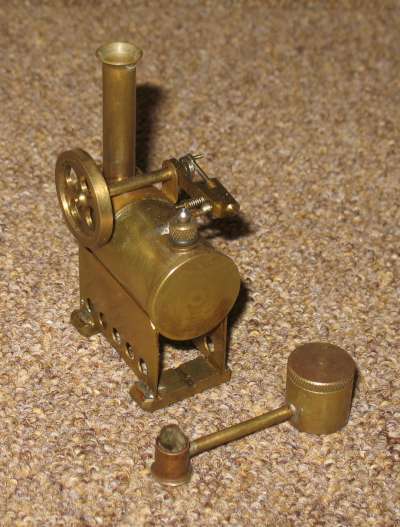 The kit of parts was manufactured many years earlier.